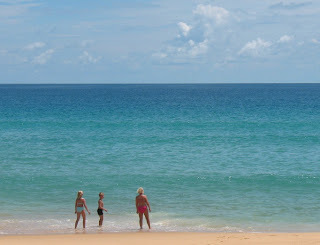 I just took a walk down to Karon Beach, just about 4 minutes from the office. I tell you what, it's a bloomin' hot day today. After my little walk taking some photos I had to crank up the aircon. There were some dark clouds around earlier, but there's been no rain. The beach was all but deserted. I saw one family and a few couples. Want a beach almost to yourself, (mostly) nice weather and bargain rates on top resorts? 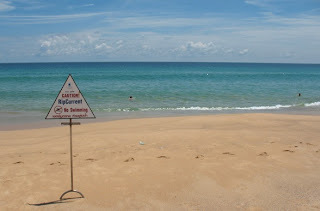 Well, you can do worse than a low season trip to Phuket! Yesterday was also a hot one. I skipped school (normally go to school with my wife to drop off our kids) as I wanted to get some temple photos. 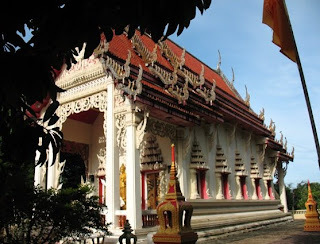 I had not stopped at Wat Thepnimit before, and I reckon it's time for another temple on my Phuket Blog!